Attention citizens: All immigrants to Panem are required to register and report to their assigned District immediately. Failure to do so will result in swift consequences. 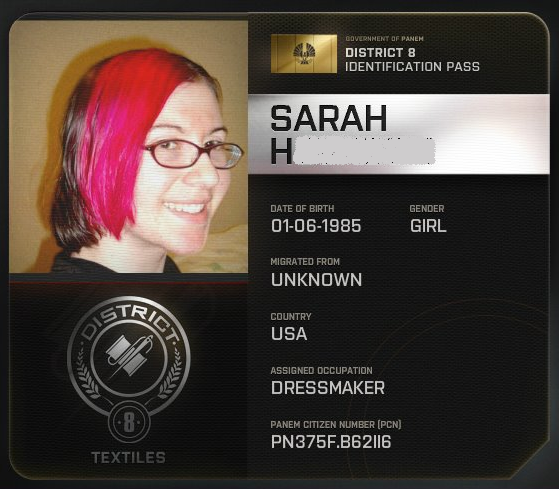 As you can see, I’ve been assigned to District 8, where textiles are the primary export. Working conditions are something like this, but I’m pretty nimble, so I have a good chance of keeping all my fingers…for now. CONTROL OF THIS BLOG HAS BEEN ASSUMED BY THE CAPITOL. PLEASE REMEMBER THAT DISSIDENT OPINIONS ARE HARMFUL TO YOUR DISTRICT AND TO PANEM, AND AS SUCH THEY ARE NOT PERMITTED. REMEMBER, THE 74TH HUNGER GAMES BEGIN ON MARCH 23, 2012. ATTENDANCE AT THE TRIBUTE DRAWING IN YOUR DISTRICT IS MANDATORY, AS IS THE VIEWING OF THE GAMES THEMSELVES.